The Association for the Advancement of Sustainability in Higher Education (AASHE) just announced that our paper ‘Connecting Competences and Pedagogical Approaches for Sustainable Development in Higher Education‘ is a winner for the 2018 AASHE Sustainability Research Award! Please contact me if you are interested in presentations or workshops on this material. Winners will be recognized during the opening ceremony at the AASHE Conference & Expo in Pittsburgh, Pennsylvania on Oct. 2. Finalists’ entries were judged on criteria including overall impact, innovation, and clarity. To learn more about AASHE’s Sustainability Awards programs, please visit http://www.aashe.org/get-involved/awards/. Rodrigo Lozano proposed the research topic and methods and lead the co-authors. Kim Ceulemans collated some preliminary references. Michelle Y. Merrill carried out extensive further research, prepared the tables, and produced a more complete draft. Francisco J. Lozano and Kaisu Sammalisto checked the framework. All authors reviewed the subsequent drafts and discussed the table contents in detail, as well as the entire paper several times. We wavered about the authorship, given that Rodrigo had started some preliminary ideas and notes for the paper with Kim and another colleague (Carol Scarff Seatter), but then I had taken those notes, done the rest of the research and writing to fill out the lists of competences and pedagogies, and created the chart that connected them. At that point, Rodrigo had suggested that I would be first author on the paper. We brought Kim back in, and invited Francisco and Kaisu to contribute in further refining the essentially completed draft of the paper and providing alternative perspectives for solidifying the chart. Lozano, R.; Merrill, M.Y. ; Sammalisto, K.; Ceulemans, K.; Lozano, F.J. 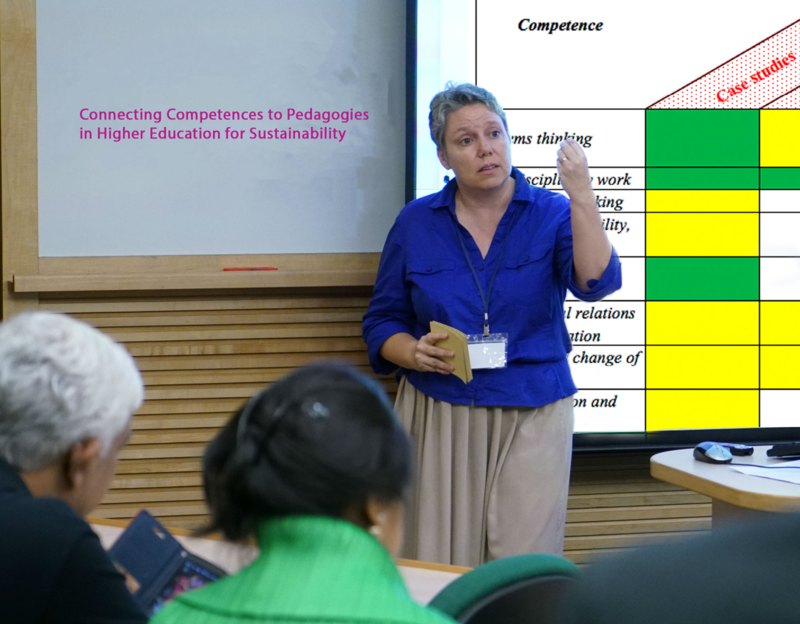 Connecting Competences and Pedagogical Approaches for Sustainable Development in Higher Education: A Literature Review and Framework Proposal. Sustainability 2017, 9, 1889. Rodrigo Lozano and Kaisu Sammalisto at Gävle University College, Kim Ceulemans at Federal University in Toulouse, and Francisco J. Lozano at Tecnológico de Monterrey and Michelle Y. Merrill for “Connecting Competences and Pedagogical Approaches for Sustainable Development in Higher Education: A Literature Review and Framework Proposal.” This paper examines how different pedagogical approaches impact the development of sustainability competencies among students. Thanks for contacting me, and my thanks to the committee for the recognition of our paper. Sorry this is not neat and tidy. After 3 years on the academic job market, I decided I needed to try something different – several things, as it turned out. You may recall that last October, I was able to get crowdfunding and a scholarship to go to the AASHE conference and present my poster on Higher Education for Sustainability in Asian Contexts and a workshop on Techniques to Foster Interpersonal Competences. It seemed like too much to ask for on a second year, and since I am starting to pursue non-academic work more intensely now, I chose not to make the trip this year. I loved being an academic, and I passionately wanted to pursue further research in the area of sustainability competences and pedagogies. I had a research plan for the next phase of this work, hoping to create a website, a book, and maybe an institute someday to focus on the challenges of how to best conduct teaching and learning in Higher Education for Sustainability. I am still doing some pro bono research and question development work for Sulitest (the Sustainability Literacy Test) that relates to these ideas. However, I needed a paid position to support my continued work on these projects. I have not been able to extract myself from the money culture: I have bills to pay, and I live in a country where medical insurance and expenses are shouldered by individuals. It was clear that I was never going to get my student loans paid and get out from under all my other debts, let alone start saving for retirement, with limited and unreliable adjunct and contract gigs in academia. Since 3+ years of an academic job search didn’t result in any offers for a full-time position, I finally accepted that it was time to release that dream, and reorganize myself to pursue something else that aligns with my driving question: How can we connect with, learn from and teach each other, so together we can co-create a regenerative, resilient culture? For today, I am still in the α-phase of my career panarchy, with a number of possible paths ahead to move me into whatever the next r-phase might be. Will winning an award for research help me (any more than my previous award for teaching did)? Who knows?